I knitted a fair isle hat and a pair of socks for my almost 4mo old nephew. 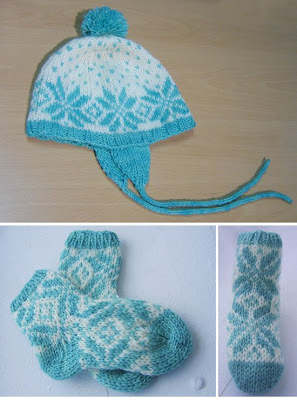 I used "Flakey Baby Socks pattern" by annypurls for the socks and whipped up the matching hat pattern using same yarn. For those who wants to make a matching hat for these socks here's what I did. This pattern with 6sts=1" gauge (in 2-color st st) will make a hat of 16" circumference, and you can adjust the gauge or the pattern to make it larger or smaller. RIBWith color A (green in this case) CO 96 sts, join to knit in round placing a stitch marker at the beginning of a row. 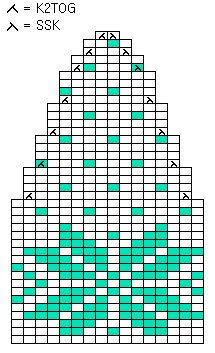 CROWNJoin color B (white) and knit each row of below chart 6 times. When you are done knitting the chart, cut the yarn leaving a tail at least about 7". Thread the tail through a tapestry needle and go through all remaining 12 sts. Secure the sts and leave the tail yarn to sew the pompom on later. Ear flapsCO 15sts work 5 rows in st st.Row1(RS): sl1, ssk, k to last 3sts, k2tog, k1.Row2(WS): sl1, purl across. Rep these two rows until 3sts are left. Knit I-Cord with the remaining 3sts to make chin straps. Make 2 ear flaps and sew them on the bottom hem of the hat. Make a pompom ( you can get directions from the web) and sew it on at the top of the hat.